Poll: Should the appearance of the ground/area around tiles we claim change after we claim them? Maybe it's actually nothing bad? So what if there could be a different way of claiming tiles on surface world, maybe that won't change their look, but something could just tell us "this tile is your tile my lord"? What if we could apply this to underground world too? So the stone paths (at the moment made when Imp is claiming the tile) could be made as now decorations ONLY and that require some building materials to make them - like UfoL proposed below the mentioned Rasmus' post above. Maybe our area of influence could be still changed, but depending where and by whom it is changed could look different? Are such, similar mechanisms existing in other games? If yes, in what form then? Let's take a look. Pic 1. Different kind of terrains - volcanic to the right and grass to the top of this picture in Disciples 2. 2. In "Dungeons 2" your area is also being claimed by Imps, however it doesn't transform tiles into the stone paths or anything else. There's also a surface world where actually claiming tiles doesn't existing, however parts of territories conquered by evil lord on the map are transforming into sort of volcanic terrain - like you can see in Dungeon Keeper series on the campaign map view after conquering lands. Pic 2. Underground world - claimed tiles got different decorations like mushrooms or spider's web around them. Pic 3. It's a surface world bridge that has been conquered by the army of evil lord that has been transformed into the volcanic terrain. 3. 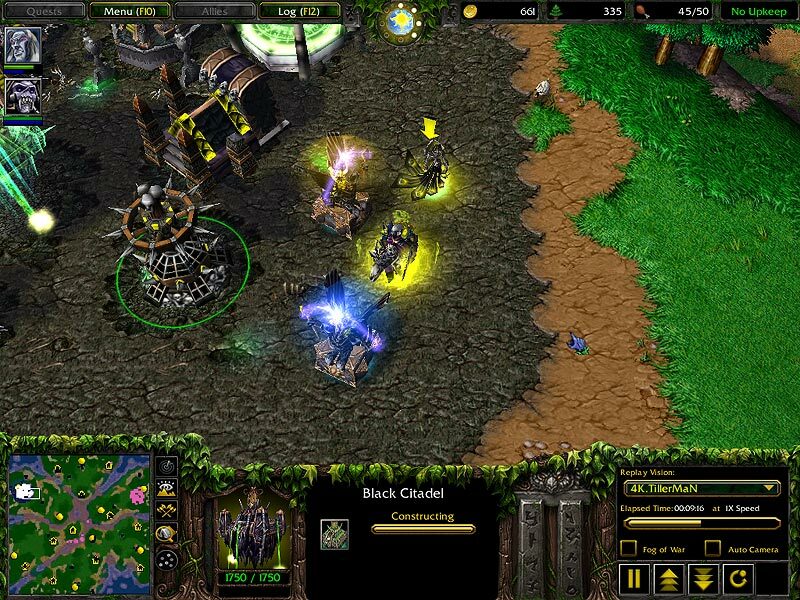 In "Warcraft 3" only the Undead faction could transform the land into different terrain, what's more only on this decayed soil they could build their buildings. Pic 4. Undead area of influence. I actually don't like the way of transforming beautiful nature into big plain of gray, hmmm... however we could transform it into the plain of pain, I mean maybe where are our tiles claimed they could turn in underground world into some magical or demonic things and on the surface into areas full of magma and blood? Maybe we just could leave the ground and area claimed by us unchanged however something would there be to mark claimed tile as ours? I personally like the idea to not change claimed areas into anything, but some small indicators like solid, scratched ground - depending on what kind of tile you claimed - could tell us a difference - the same could work for surface world. The soil of the surface world could look a little scorched when claimed by our Imps as the soil of dungeons could be a little more looking like a dungeon, a little bit more volcanic. Anyway what do you think guys? Should our moves influence the nature, or it's ok to have everything greystoned or maybe environment even our control shouldn't change whenever we claim the tiles and expand our influences? It is not only the appearance that worries me about claiming tiles above ground, it is also that there are no boundaries. Perhaps in the future the player will have more control over the path claiming and there will be more boundaries above ground. But for now I think it is best just to have it so that the surface is for raiding only. Hmm... then what if there will be places where Imps just couldn't claim tiles and some places would be claimable? I know that in Dungeons 2 they did surface world only available for raids which people have different opinions about that, does it mean surface would will not be diggable? I think the problem of borders itself is quite easy to solve. Many games have similar solution. The area of influence maintained by some static structure. Starcraft: zerg's creep, protoss pylon's energy field, warcraft: undead - just like zerg, settlers: fortress expanded kingdom borders, black & white temples expanded trritory, dungeons lairs expanded territory, earth series power plants (excluding LC) let structures function only near them, command & conquer games allowed to build only near already built structures (every building expanded territory a bit, just was not visible to player). I think there is many more examples. I think solution similar to undead from warcraft would fit well to the game. Uprageable pylons or huge bonfires that would spread dark energy in certain range. We could uprgade it (add more wood to make it burn brighter, more stone to make it taller etc.). The larger the structure the larger the area controlled. The brighter, the stronger additional buff effects etc. I think we could adapt this solution to this game. There could be either pre generated posts to rebuild/repair, claim or conquer, that would expand area of influence and let player build in it. Or the player should build such structures on his own. We could aslo mix both. Most of times players would need to build their own short ranged pylons, but there would be some special long ranged already existing on the map. Those would require significant ammount of resources to repair/claim, and would usually be heavy guarded. It would sometimes grant some unique aura effect around whole area. Positive (more resources to activate) or negative (more resources to get rid of). Those would be usually generated inside of castless/fortesses or near some fortification. But it would also had medium chance to spawn in open ground, preferably near some some special terrain formation, or some kind of artifact. For example the smallest post would resemble big burnig torch. Bigger would be like big campfire. Medium would be something like the cone/pyramid from pictures above. 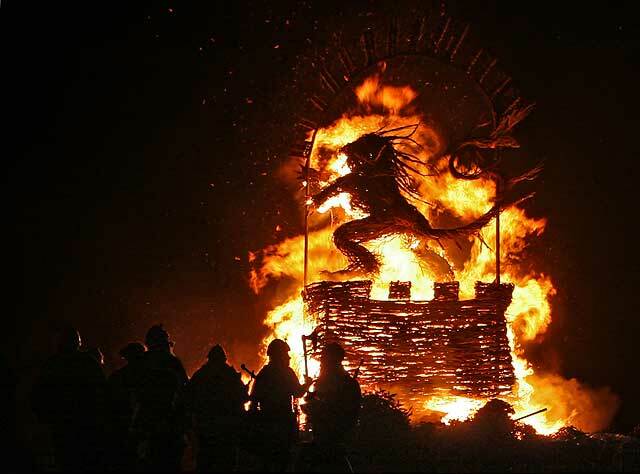 The largest may be burning effigy presenting some demonic figure. 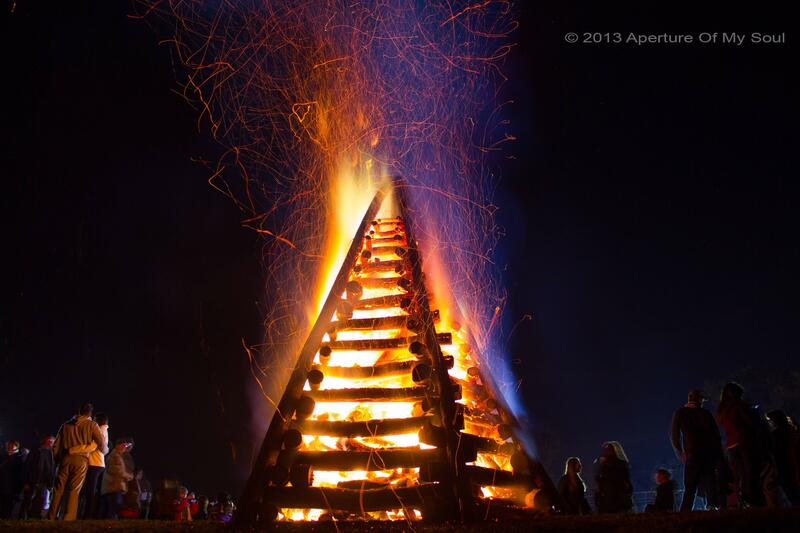 The larger the bonfire the bigger the area. Tiny and small ones would require to be build on already corrupted land, but will also require little resources to build. Medium one can be build outside of area of influence to set up new outpost. Large and huge would provide additional buffs to minions, or negative effect to enemies. There should be an option to disable fuel delievery so player can turn of fires in places he no longer need/use and save it for more important nodes. If we decide for another form of posts - like starcrafts pylons - we could use mana as fuel. It could also function as power nodes that transmit mana to smaller posts nearby visible as beams or dark energy ribbons. If one transmitting node is lost then whole circuit is broken and disconnected nodes gradually shrink their area of effect (creeper world is good example). Larger nodes could spend some addidtional mana to focus the beam on enemies from time to time. 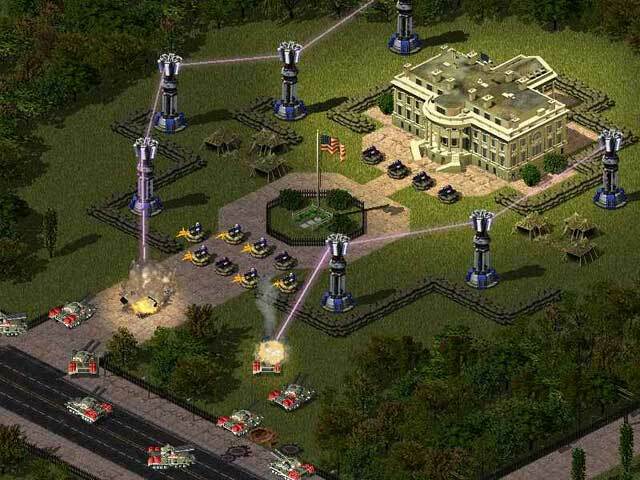 Similar to red alerts prism tower. Once some terrain is in our area of influence it would graduall turn into altered version (volcanic, undead, demonic, dark etc), then we could pave the ground with stone. Stone pavement will be required to build rooms/houses. Unpaved would let player place only basic structures - wooden wall, ladder, spike pits, etc. Pavement could also provide minor speed boost. To avoid overclicking building rooms and advanced structures on unpaved ground would queue paving automatically and add required resources to te rquirement list on building site. If the block is dug out stone is returned and it place is left as unpaved. This way we would avoid parkings, slow down the expansion. How about having structure indicate claimed areas instead of imps? Like say, building a raiding camp would make that your area, but the terrain itself would remain the same? I honestly never really approached the surface world, in my off the wall pondering, as a place that players would claim. To humans, it's warm, inviting home; but to Dwelvers, it's a a foreign, unwelcoming world far to bright for their darkness suited eyes. Sure they make expeditions up there. They pillage, and burn, but they don't set up shop up there in any meaningful way. They live underground. Not on the surface. Why would they even want to? If you approach it like this, while it might seem limiting, this limitation, I think, could enhance the game greatly. Making the surface world a place where a player can never really utterly control, or get a meaningful foot hold aside from some raiding camps or other less established constructions. That brings me to another suggestion. Am I the only one that thinks perhaps the surface world should have it's own construction set? And, that, perhaps, it should be more limited. I mean, I don't think you should be be able t just slap together a basic cookery and bedroom and begin migrating up there. In short, players shouldn't ever feel like the surface world is just 'going upstairs on the next floor.' It should remain a foreign landscape. By tactfully limiting what a player can do on the surface, one could keep this aura of surface world being alien and unfriendly. Much like, I believe, our demonic creatures would view it. That's just my two cents. Bare in mind, I'm not at all in the known on any of your current plans of the surface world. Oh, and encase I wasn't clear, I don't think any sort of 'claiming' should really be done on the surface world, atleast, not using the same mechanics as claiming tiles underground. Like Ufol mentioned, I think the mechanic in Starcraft of Zerg Creep would make more sense for laying claim to territory. Obviously we wouldn't want to make an identical copy of creep covering the ground because that style doesn't really fit, but instead you could have the plant life wither in the area of effect and have a fog that covers the ground, not dense enough that you can't see the grass has been corrupted, but the fog would imply the darkness moving out over the land. It would also be nice to use this feature upgrade to revisit the Evil Meter and Hostility Level discussions. Considering the Hostility Level idea SU proposed, it could make a real difference in the Hard and Impossible difficulties which I think need retuning anyways because it seems as long as you survive the initial wave of Rouges, the rest isn't that hard to fend off and destroy when a good sized force is amassed. I see guys you're agreed with system of expanding our AoI (area of influence) by having objects that conquered/claimed will expand our area of influence. You gave as for example the StarCraft mechanism of expanding AoI like I gave about Warcraft undead way to expand AoI. I see in this only one problem - I mean by this we can't or we rather shouldn't change the way of expanding our AoI - so by claiming tiles..
...unless you think about objects to conquer that will let Imps to claim that territory, but also this claiming won't change the environment appearance - unless you want to see everywhere a parking lot - so this why I made this topic open for us to think too, but I'm glad everyone can see the real problem like Rasmus who noticed it in first place. So what do you think, feel about that issue? P.S. I agree that none specific plans are made for Surface World visible to public, I don't know them either, maybe Rasmus would like to be so kind and present the way of expanding our AoI in the Surface world? I don't know about that. I think claiming tiles on the surface should be all about the AoI and not Imps laying claim. That method will be too problematic because there's no mode to control where their limits are on the surface unlike the underworld which at times can be uncontrollable when you open into new areas, but mostly they just claim where you limit their dig sites. Even if you could place a boundary, then how do you limit how far you can go? It could easily get out of control if you expand your space to claim too far, and potentially halt work progress because all your Imps are claiming things. Now, since we have little to go on Rasmus' ideas for where he wants to take the surface world this is all just conjecture, but assuming these little villages will be strewn across the surface it could be that the AoI would either emanate from those raided villages, your claimed portal sites, or a combination of those. If we look back to that Evil Meter discussion, it could be the basis for how far out that AoI extends on the surface. Perhaps we would also build Guard Posts on those areas to either hold them or give a slight extension to the AoI. The more AoI, the level of hostility towards you would increase, and enemies would be more prone or send larger forces to try and reclaim their land by taking back portals or villages, or your Guard Posts. Another way to limit claiming of overworld is to disable automation and let player fully controll where he want territory claimed. Each tile would cost some stone to claim and lay bricks. It could work as well in dungeon. This way we would avoid parking lots above and under the surface (unless player want to build one). Additionally as Mello mentioned, we would not have to wait untill our army of imps finishes claiming large areas before going back to work. They would also stop rushing into group of enemies because there is one unclaimed tile behind them. The area to lay bricks would be set in the same way as you place any room blueprint. Just rightclick dirt path and pick "lay bricks" icon, then lay the blueprint in the area. Whole AoI mechanics would not have to be worked on. Else it could be used as buff giver and a barrier that prevents player from building anything in hostile AoI - around fortress for example. Player would not need his own AoI, but it would prevent enemies from building anything inside of it - rougues building bridges or placing blocks for example. It would have much more meaning in multiplayer games probably. Enemy would have to conquer/destroy source of AoI before he could set another raid camp deeper in opponent's territory. In other words, area outside of AoI is everyone's property, and only things inside of AoI are private. I played Dungeons for some time and i found static AoI generated by lairs quite annoying in dungeon. It may be only me, but i like to have control over what and where i want to build. The AoI system is ok with the surface (as long as you decide where most AoI sources are built), but for me it definitely doesn't fit underground, and it would be great to have similar system both above and below surface. I had this weird idea a while back of using 'treasure chests' as a means to expand influence in an area. This would have a two fold purpose, creating a means of giving limitation to expansion, as well as giving a use for mining gold that is distinct from the idea of 'paying wages', which, with this system, could be cut entirely and still give gold a high value. Plus, it sort of fits. Going from the view point of role reversal, which I'm so keen on, why is it exactly that dungeons and labyrinths beneath the earth often have treasure chests filled with loot? And why do, creatures with seemingly no trade system, or any real need for the stuff, guard and hoard gold with such tenacity? Well, if you consider this system, it makes perfect sense. The gold is the means in which there master is allowed sway in there world. So, of coarse such chests would be abundant, and of coarse it would be well guarded. As, in the system I imagine, the loss of the gold within would shrink there influence over the land surrounding the gold itself. This would also create more focal points for the dungeon to defend, much like how when portals from the surface world to the underground are implemented, as they are planned, would create tactical places to defend. Each chest would be like a miniature dark mother, loosing one could case an entire section of the dungeon to go blind and fall out of influence. Now, if this was implemented, or some other limitation on underground influence or land claiming were in effect, then one could make it so that one could only build on an area when the underground beneath it was under there control. I think this limit would be satisfactory, and would prevent things coming out looking like a 'parking lot'. Still, that being said, I like the idea of being able to pave areas above ground as Ulof described, mostly because I fancy the idea of making grand looking dungeon entrances over my portals, like giant skulls with open mouths that heroes enter, and alike. Very interesting idea Dav. However i'd try to put it into room system. Good old tresure room would be a place where we could build some kind of statue or giant pot of gold, which would expand area of influence. The more gold in it the larger the area controlled, but up to certain limit. Player would need to expand room itself to make place for chests, which would hold some of treasures as well. Filled chests would amplify central structure and let it expand area of influence even more. The structure itself should be relatively cheap or medium cost, because most of valuable resources are used to fill chests, thus being the main cost of whole room. Id divide treasures into three type for it: coins, gems, trinkets/jewelery. Regular gold nuggets would remain resource and would present no treasure value. Player would need to make coins from gold in metalwork room. Gems could be mined and used right away, but a bit rare. Another construction - jeweler's desk - would be used to combine gold (not coins) and gems into jewelery. Each tresure type would have different value: coins 1, gems 2.5, jewels 5. The more value in chests the more area controlled. Each chest would have limited capacity. Treasure rooms would become primary targets for rogues. Instead of looking for DM, they would try to locate tresury, break the chest and steal shinies then run away to some safe spot, or store them in overworld fortress.